The invitation was intriguing...It was printed with retro blooms on one side and polka dots on the other, with a bunch of white bobby pins attached. Was this a teaser of vintage inspired outfits? White hardware on clothes? 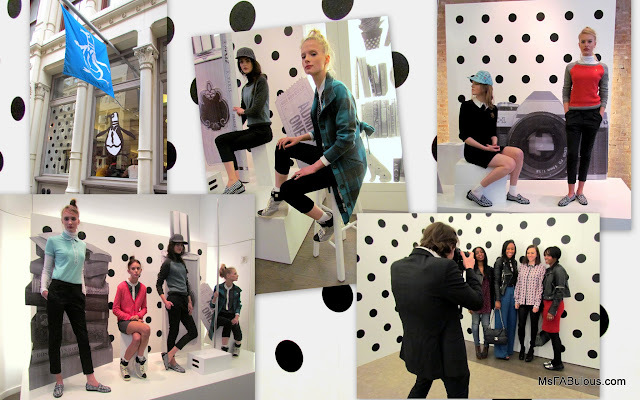 The Fall 2012 presentation at their Soho boutique answered the question. Guests perused the sunny presentation with Mimosas, mini lox bagels and homemade pop tarts. Sweet cardigans in bright coral, turquoise and black and white topped flirty mini dresses. Cropped cigarette pants and pastel knits evoked the 1960's sweater girl. A-line printed or brightly colored solid cotton coats made the perfect topper for chillier autumn nights. I love that flowers are blooming and fall fashion will too. At least I have something to look forward to when summer is over! BONUS: Take 30% off Friends & Family online and in-store with this coupon.